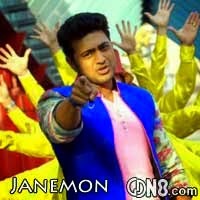 Janeman Song Lyrics from bengali movie Herogiri 2015.Directed By Ravi Kinagi. The Song Is Sung by Benny Dayal & Dipali Sathe Music composed by Savvy And Song Lyrics Written by Raja Chanda. Starring: Dev, Koel Mollick, Sayantika Banerjee Mithun Chakraborty And Others.